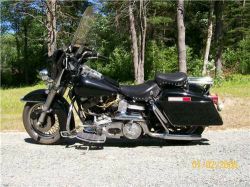 The 1979 Harley Davidson Police Motorcycle for sale is a vintage FLH Shovelhead Police Edition MA State Trooper "Police motorcycle" with an electric Start, Crash Bars, Fairing and Windshield. The old Harley for sale has Disc Brakes front and rear, a King and Queen Saddle, Front Running Boards, Directionals front and rear, an S & S Carburetor and 2 sparkplugs per cylinder. There is a set of Fiberglass Saddlebags,a Rear rack behind the passenger seat and a blue diamond police tail light. The 1979 Harley Davidson Police Motorcycle for sale is in excellent running condition with low mileage. Read this opportunity to Feel the thunder under your seat and experience "Authentic American Milwaukee Iron" in action! The motorcycle is located in Hippy Hill Danbury New Hampshire and the asking price is $9,400 firm but there is financing available if you need it. If you're in the Danbury New Hampshire area and would like to take a look at the 1979 Harley Shovelhead or have questions you can reach me by e-mail using the comments form located directly below this ad. GoGoCycles Used Motorcycles for Sale would like to extend an invitation to anyone who is having problems with their 1979 Harley Police Motorcycle to leave their questions or describe the exact problem that you're having and your contact information in the space below and see if somebody who stops by may offer a solution for how to fix your motorcycle. We also encourage bikers to submit their opinions and reviews of the 1979 Harley Davidson Police Motorcycle for sale to help potential buyers make informed decisions and to benefit the biker community as a whole.